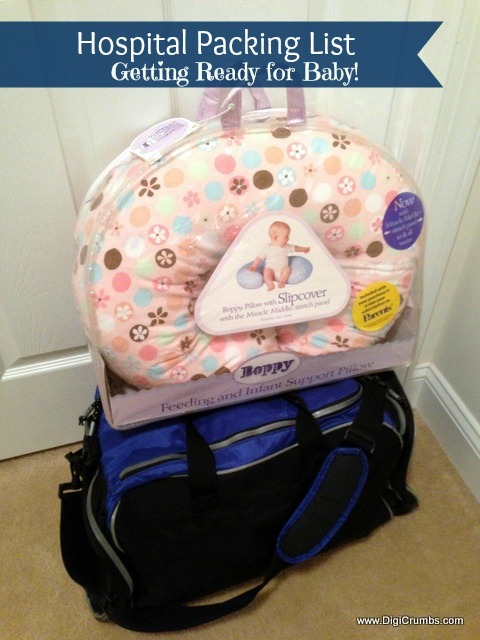 I try to keep packing for the maternity ward simple. Who wants to lug everything but the kitchen sink around the hospital? Plus packing light makes it easier to find what you need quickly. I’ll be delivering my second child at the same hospital, so it should be a lot easier this time around. I now realize what was not needed that I packed last time, and what I missed that I wish I would have packed. Here’s my list of everything I’m going to consider taking to the hospital. I like to put these items in a small zip top bag for easy access, stashed in my duffle bag until needed. Last time I packed all kinds of fun entertainment options, thinking I would have hours of waiting that I could relax and watch movies on a laptop with my husband, magazines to read, etc. Ha, ha...boy was I ever wrong! I must have been watching too many Baby Stories on TV, because I chose to give birth naturally and was in active labor the whole time without a break. There was a point where I would have considered an epidural, but it was the middle of the night and I told the staff early on not to call in the anesthesiologist. In the end, I’m glad it worked out the way it did, all the pain magically disappears as soon as the baby is pushed out. Pack in a small bag stored inside duffle bag, unless you have as much camera equipment as my hubby. - iPhone & Charger - This eliminates much of the comfort items (family picture, music, entertainment, etc.) I brought last time when smart phones were non-existent! *Make a List of Items to Grab Before You Head Out the Door and Put On Top of Hospital Bag Some items like a nursing pillow, I’m not going to use everyday and they can be packed and waiting, but I only have one small makeup bag so that’s not going to be sitting in my hospital bag for a few weeks. These items are things I use daily that I’ll need to grab before heading out the door. Put Towels and Garbage Bag in Car to put on the seat for the ride to the hospital. In case water breaks, you won’t have another thing to clean when getting home from the hospital. Everyone’s list will be different, but as long as you have the necessities (place for baby to sleep, clean clothes, diapers, wipes) you can figure it out as you go. I like to be organized and prepared, so I try to have everything ready in advance, but delivering a baby can be unpredictable so you just have to do your best and be ready for anything. This is wonderful. I was going to wait another 2 to 4 weeks to start packing but I've decided not to wait since my son was early. Most of these lists are excessive and since I'm going all natural, I probably won't need all the extras.